Old Dominion is a premium, handcrafted After Shave Balm with Allantoin and Menthol. The scent contains mahogany woods, Italian leather, sweet tobacco with just a hint of Patchouli. Rugged, manly, handsome. These words come to mind when describing the scent of Old Dominion after shave balm. It has scent notes of deep mahogany woods, butter soft Italian leather and sweet tobacco, with just a hint of well aged, dark Patchouli. Old Dominion is a premium, handcrafted After Shave Balm with Allantoin and Menthol. Use on the face after shaving to soothe and cool. It can also be used on dry elbows, heels, hands or knees. Apply a small amount wherever it is needed. If you are a wet shaver, you need Old Dominion After Shave Balm in your daily routine. 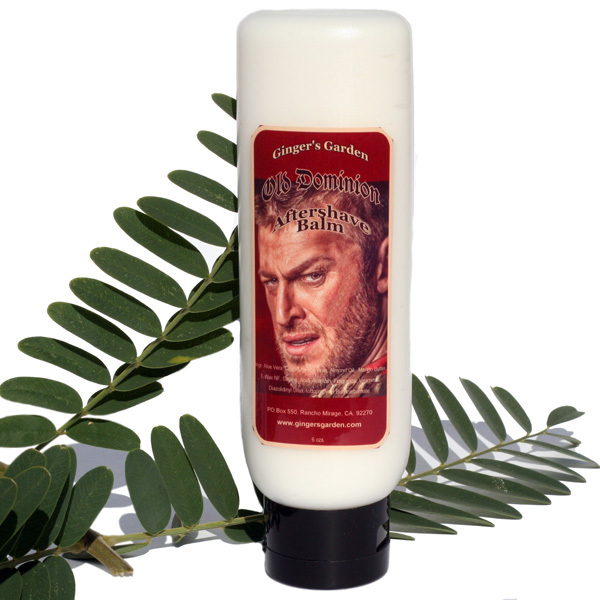 A Matching wet shaving soap and aftershave is available. Organic Aloe Vera, Coconut oil, Rice Bran Oil, Almond Oil, E-Wax, Mango Butter, Stearic Acid, Allantoin, Vit. E, Fragrance, Diazolidinyl Urea, Iodopropynyl Butylcarbamate, Menthol.